A dragon theme is a hot classroom theme for summer, and cool for any time of year. We haven’t found any ready-made bulletin board sets featuring dragons, but you can get creative with posters and party decorations. 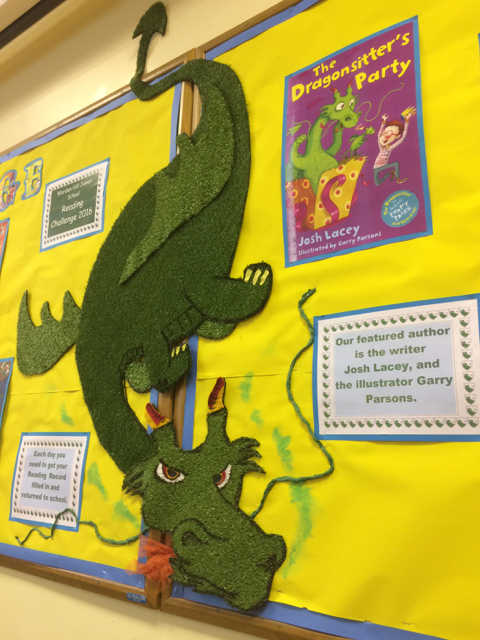 Josh Lacey‘s blog includes a photo of a bulletin board dragon cut from Astroturf. Project your favorite dragon book illustration onto a sheet of paper, cut the dragon out, and use it as a pattern. We’re not dragon our feet in fifth grade! Get fired up for first grade! Come into the Dragon’s Den! Sir Readalot Conquers the Dragon! One area where a dragon theme has a big advantage is in books. There are plenty of awesome dragon books for kids. In general, there are two kinds of mythical dragons: European and Chinese dragons. European dragons fly, breathe fire, live on a hoard of treasure, and fight with knights. Sometime they eat people, especially young girls. Chinese dragons are powerful but good, unlike Western dragons which are often evil. There are different kinds of dragons in Chinese mythology. They live in different places and have different roles. You might choose one kind of dragon over the other, or use your to compare the two. A komodo dragon can be 10 feet long and weigh 300 pounds. That makes it the biggest lizard in the world. It has 60 sharp teeth that deliver a venomous bite. It’s teeth are like those of a prehistoric velociraptor. They’re not fire-breathers and they don’t look as fancy as fictional dragons — they can’t even fly. But komodo dragons run fast and can take down a water buffalo. We saw this komodo dragon at the Tulsa Zoo, but they actually live on islands in Indonesia. We don’t have to worry about meeting them on the way to school.